The City of Tualatin, Oregon, is located both in Washington County and Clackamas County. It is located 12 miles southwest of Portland is considered a suburb of the Portland Metropolitan Area located south of Tigard. 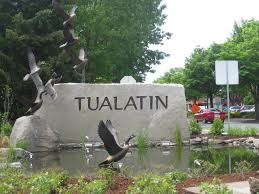 As of the 2010 census there were 26,054 people living in Tualatin. 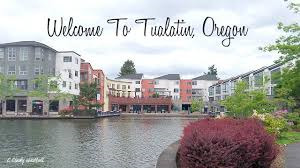 Tualatin is named for the Tualatin River which flows along most of the city’s northern boundary. There are many different definitions of ‘Tualatin’ – most derived from Native American language. Some meanings “lazy” or “sluggish” or “forked”, most describing the qualities of the river. In a recent satisfaction survey, 84% of the residents rated their overall quality of life as “excellent” or “good”. Tualatin residents enjoy many amenities such as parks, unique shopping and dining choices. Tualatin is home to Bridgeport Village an upscale shopping area that opened in 2005. There are many factories in Tualatin including Novellus System and Kershaw Knives. 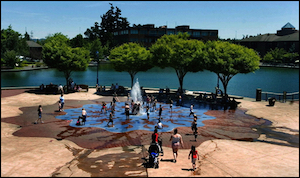 A main attraction in Tualatin is Tualatin Lake and the surrounding 5 acre plaza, Tualatin Commons, home to many events including Pumpkin Regatta, Holiday Lights, and Concerts on the Commons. Tualatin has a unique display of a mastodon skeleton, located in the Tualatin Public Library, which was excavated in what is now the Fred Meyer parking lot in 1962. If you or someone you care about has been arrested for DUI or DUII (also known as Driving Under the Influence of Intoxicants), you probably have many questions running through your mind right now. You’ll find some of those answers here, but please remember that each person’s case and circumstances is unique so FAQs on a website is never as good as talking to a DUII attorney who specializes in Oregon’s DUI laws. You happen to be on my website, and I’m proud to say that the Reynolds Defense Firm team is one of the top DUI defense firms in Oregon. Our first phone conversation is free, so please give us a call to talk through your situation. Every day we talk to folks who have been arrested and have questions about things like Field Sobriety Tests, the Breathalyzer results as well as implications to their Driver’s License so I’m confident we can help you get some of the answers you’re looking for which will help you sleep better at night. If you are facing DUI or drunk driving charges in Tualatin, Oregon or elsewhere in Washington County, it is important that you find a DUII attorney to help find your way through the court system. No matter how much you may believe the charges are wrong, or if you believe that you are facing a conviction, it is important that you get the advice of an attorney who understands the ins and outs of the criminal justice system in Tualatin. We never recommend that anyone DUI charges alone, although the court will let you do that. We think that you should find an attorney who knows how things work in Tualatin Municipal Court and Washington County Court. Hire Reynolds Defense Firm, hire someone else, but make sure you have a DUI lawyer familiar with Washington County Courts by your side. We don’t make this recommendation because you’re not smart enough or able to articulate the facts of your case, you are, but because there are serious consequences of DUI charges in Oregon – if anything goes wrong in court, you end up in jail that day. Our justice system is not logical and seldom linear; your best intentions can backfire with outcomes that could have been prevented if you had someone familiar with DUI law in Tualatin by your side. When you show up in court without a lawyer, you’re telling the courts that you don’t take the matter seriously. If you need help with a DUI arrest in Tualatin or anywhere else in Washington County—please call Reynolds Defense Firm at (503) 223-3422, or contact us using the online form to schedule your free consultation. Our DUI attorneys have over 35 years of experience working in the Portland Metro area including Tualatin Municipal Court and Washington County Court can help answer your questions to figure out what the best steps are for you and your family. We’ll help you get back to being the good person you were before this arrest.